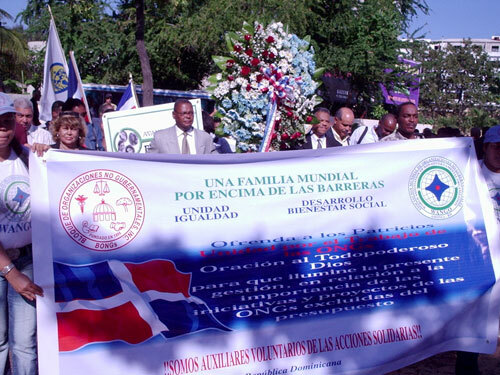 WANGO began 2007 by marching to the Presidential National House in the Dominican Republic, on January 24, to personally deliver letters and statements to President Leonel Fernandez. The letters requested that the President reconsider his decision that eighty percent of the NGOs in the Dominican Republic will no longer receive any governmental funding. Out of approximately 3,300 NGOs, this would leave 2,900 NGOs without funds that would potentially have to close down. Mr. Juan Larancuent, President of the Dominican Chapter of WANGO and of el Bloque de Organizaciones No Gubernamentales Inc. (BONGs), felt especially abandoned by the presidential administration having previously served before the Senate and House of Deputies. Representatives from both WANGO and BONGs participated in the march presenting the president with an alternative plan that would allow these NGOs to receive funds. On February 28, after no response from the Dominican government, a second march took place. Finally, on March 3, in the article "Dominican Sectors in a Final Showdown Over NGOs," published by Dominican Today, it was reported that many social organizations supported the President's decision. It was stated that the NGOs to be excluded from the 2007 budget would be those that are directed by elected legislators and don’t have a clearly defined function to benefit the community. The 2006 World Congress for NGOs and the WANGO Awards were supposed to take place from November to December in Jordan. However, this was unexpectedly cancelled when Jordon’s government wanted to postpone the event. Taj Hamad, Secretary General of WANGO, did all he could to reschedule but could not book a facility on such short notice. He then focused his attention on the planning of the 2007 event. On April 21, the 2006 WANGO Awards were celebrated in Albacete, Spain during the First World Congress on Early Childhood Education for Peace. Five NGOs were awarded by WANGO. The Environmental Award went to the Altai Foundation of Russia, a nonprofit organization dedicated to protecting and sustaining natural and cultural heritage in the Altai Mountains. The Human Rights Award was given to Free the Children of Canada, a youth organization of children helping children through education. Paz y Cooperación of Spain, an organization focusing on development, human rights, and global peace education, was presented with the Peace & Security Award. The recipient of the Education Award was the South Society for Special Education, which is the only NGO in Jordan that address welfare issues with people disabilities. The last award, Civil Society Development Award, was presented to Ashoka, a global organization that identifies and invests in guiding social entrepreneurs who have idea for change in their community. 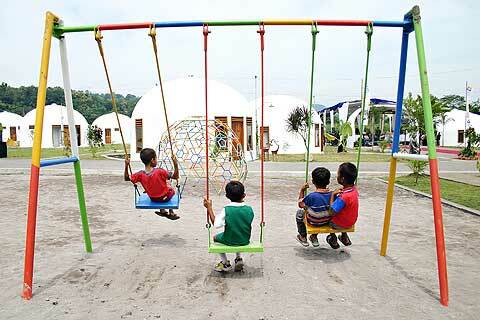 In May 2006 an earthquake struck Java, Indonesia killing over 3,000 people and destroying numerous villages and homes. In response to the earthquake, Taj Hamad, Secretary General of WANGO and Mohamed Ali Alabbar, Chairman of Emaar Properties, agreed to bring relief to a village called Ngelepen. They planned to recreate the village through a partnership with Domes for the World Foundation (DFTW), a nonprofit organization based in Texas. The project was initiated in October 2006 and was completed in April, two months ahead of schedule. The new village has 71 houses, 6 MCKs (laundry, toilet, shower facilities), and a primary school, mosque, and health clinic. 6 new wells and 6 new septic tanks were built. The houses are in clumps with 12 houses per 1 MCK. Over 370 people, both villagers and international workers, took part in the rebuilding. On April 30 2007, a ribbon cutting ceremony and the opening of the new village was celebrated by national and area leaders, the donor, WANGO representatives, and the village families and neighbors. New Ngelepen, Indonesia has approximately 250 residents. WANGO is very grateful for the generous funding, expertise and support provided by so many for the project. On June 8, WANGO hosted a gala fundraiser called Africa Rising in New York City. The event focused on celebrating African NGOs and recognizing the achievements of Africa's grassroots organizations. The African NGO sector in recent years has grown and expanded confronting many serious political, economic, health, education, and hunger/poverty issues of the continent. All of the proceeds from went towards supporting African NGOs and strengthening the sector. A'l Saleh Development Foundation located in Nigeria was founded in 1999. It focuses on providing basic education to women and youth, including health, nutrition, and HIV/AIDS education. Child Welfare and Adoption Society in Uganda is a Christian NGO that promotes and advocates for children’s rights and focuses on healthy growth for vulnerable children. Nyada Matero Community Youth Development Center based in Zambia works to empower youth and teach them life skills. It is a predominately volunteer organization. The Corban Foundation in Ghana was established in 1997. It is a charitable nonprofit NGO that focuses on gender equality as well as social justice and sustainable development. The Association of Volunteers for the Fight Against Terrorism in the DR Congo is a human rights organization. They combat cruel acts of violence, terrorism and torture. 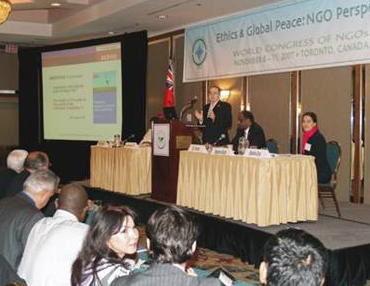 From November 8-11 the World Congress of NGOs took place in Toronto, Canada. All together, 155 leaders from NGOs in 30 different nations, in addition to prominent leaders from both the governmental and for-profit sectors, participated. The Congress's theme was Ethics and Global Peace: NGO Perspectives in which the NGOs focused on co-prosperity throughout the world and how ethics plays a role in the NGO community. Throughout the conference, thirty-five sessions, workshops, and events were convened. 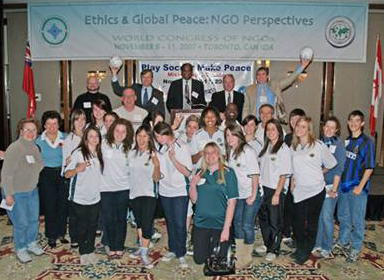 The Toronto Declaration of NGO Core Values was drafted and affirmed by the participants of the World Congress of NGOs. 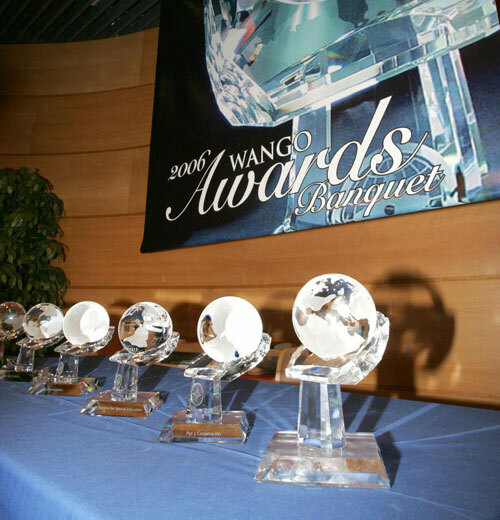 The World Congress was also a forum for the 2007 WANGO Awards that took place on November 9. In the absence of Dr. Noel Brown, the Awards Chair, Jean Rondon, WANGO's Publication Director, served as the Master of Ceremonies. Four NGOs and one outstanding individual were awarded for their achievements. Ecotrópica, a nonprofit Brazilian environmental NGO dedicated to preserving and protecting the Pantanal, the world's largest freshwater wetland system, was granted the Environmental Award. The recipient of the Humanitarian Award was SurfAid International, started by a small group of surfers who work to improve the health of the Mentawai people of Indonesia, specifically focusing on malaria and other preventable diseases. The Peace & Security Award went to the Center for Conflict Resolution & Reconciliation, an organization that focuses on empowering marginalized groups through decision-making processes in order to contribute to a non-violent Palestine. The World Association of Early Childhood Educators, an NGO that provides services and support to educators of young children, received the Education, Media, & Arts Award. Lastly, the Universal Peace Award was presented to Chief Oren R. Lyons, the traditional Faithkeeper of the Turtle Clan. Also a member of the Onondaga National Council of Chiefs of the Six Nations of the Iroquois Confederacy, Chief Lyons has been a leader in advocating American Indian causes and rights and is recognized internationally for his efforts in promoting peace. On November 10-11 in Mississauga, Canada, a city right outside of Toronto, five teams of young women ages seventeen and under came together to play for the first ever Play Football (Soccer) Make Peace (PFMP) women’s soccer tournament. PFMP is a global peace project launched by WANGO in July 2004 and the tournament was part of PFMP's "Young Women in Soccer" project.